A couple of hours after incident 87, another one was reported at virtually the same spot. Again 2 people (this time two ladies aged 59 and 72) had been blown off their feet by a strong gust of wind. One suffered a suspected broken collar bone and a cut to the head while the other had a few cuts on her arms and head. 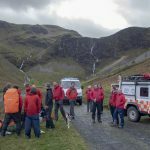 The team landrover drove to the casualties along the mine road, this time from the Catbells end and were on scene within half an hour of the call. 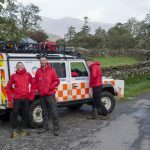 Both ladies were assessed and made comfortable and driven to Keswick Cottage Hospital where they were transferred to the land ambulance for transport to the Cumberland Infirmary.